http://www.rrbchennai.gov.in is the official website of Railway Recruitment Board (RRB) Chennai. Applications were invited for Para-Medical Recruitment in Indian Railways. How to Apply for Para-Medical Category in Indian Railway? 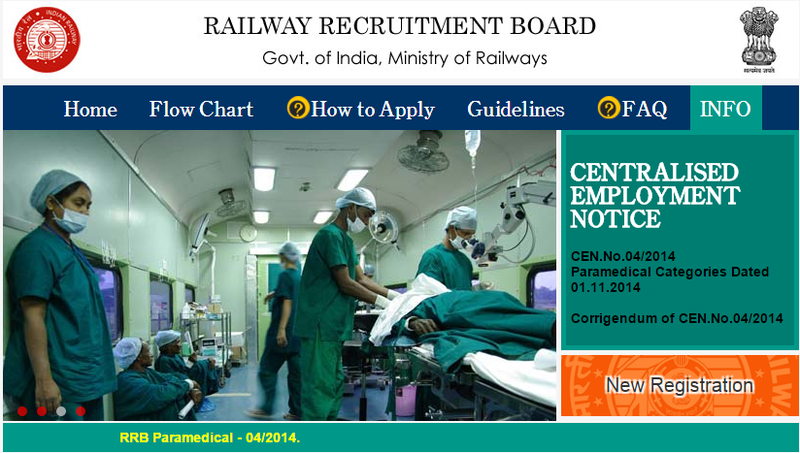 Interested and Eligible candidate can apply for Para-Medical Category in any one of the Railway Recruitment Board (RRB) only. Visit the respective RRB Website and apply for the post Online. Click on New Registration and Register yourself. Fill the relevant details and make the payment of the Examination Fees and Submit the Application. Login with the Username and Password. Select the Post applying for. Enter the Qualification details. Make the Payment of the Exam Fees either through Online (Debit Card or Credit Card or Internet Banking) or through Offline (SBI Chalan or Post Office Pay in Slip). Download the Template and affix recent Passport Size Color photo, Sign on the Space Provided, Affix Left Thumb Impression, Copy the Self Declaration in the Space Provided in your own Handwriting. Scan the Template (JPEG, Color, Less than 200 KB, 100 dpi) and Login to your account and Upload the Template and Submit the Application. No need to send the physical copy of the Application.